Here is the solution to fix HP 515 error Power Supply Fan Not Detected error. For those of you who are here who have installed a new power supply into your HP machine and want to get rid of the power supply fan error (515), there are a couple of possible solutions. The problem is based on the fact that the original power supply provides a tachometric signal from the OEM PSU (tacho- meaning speed, and metric meaning the measure of) to the motherboard that tells it if our PSU fan is spinning and everything is ok. When the power supply is replaced, that signal is no longer provided to the motherboard. To fix the 515 Power Supply Fan error, you must find some other way of providing the tachometric signal that the motherboard is expecting to see at boot to avoid encountering the fan error. We could take the easy route and take advantage of the fact that we already have places on our motherboard outputting the tachometric signal that the other part of the motherboard is expecting! This signal is found on any fan connector on the motherboard for which a fan is connected and spinning. For a generic fan connector this signal is outputted from the SENSE signal or pin 3 on this diagram below. 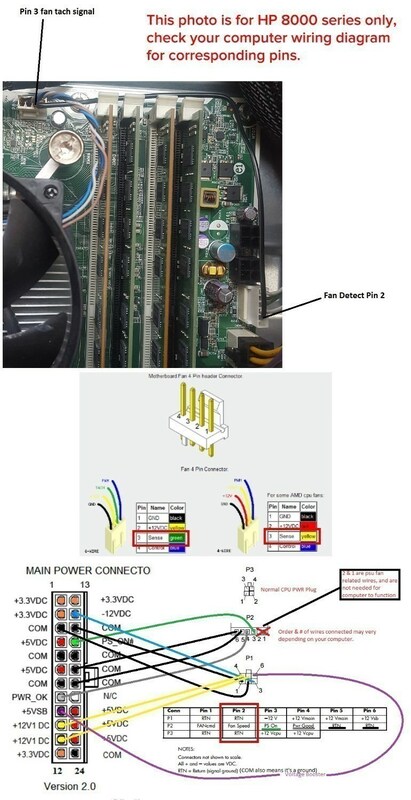 So our goal really becomes, find which pin on our motherboard that is expecting to have a tachometric signal provided to it (for 8000 series it is pin 2 on the P2 connector according to below picture and send the signal from our cpu or case fan (pin 3 on a generic connector), to that pin on the motherboard using a single piece of insulated wire. This is the finished wire on HP 8000 series machine and it successfully bypasses the fan error at little to no cost.